High-performance thermoplastics, such as PEI, PAEK and PPSU are increasingly in demand for industrial-grade manufacturing applications. Within the field of additive manufacturing, Fused Deposition Modelling (FDM) is the most commonly used technology for 3D printing with PEI, PAEK, and PPSU, with these thermoplastics used in the form of filaments. In today’s tutorial, we’ll explore the process of 3D printing with high-performance thermoplastics, including the pros and cons, applications and the key 3D printing requirements when working with these kinds of materials. 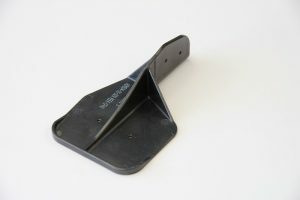 High-performance thermoplastics are unique among other 3D printing plastics (including PLA and ABS) thanks to their excellent mechanical properties, which make them suitable for engineering applications. Strength, durability, heat and chemical resistance are just some of the properties that make this family of thermoplastics highly sought after materials for a range of industrial applications. Polyetherimide (PEI) is a high-performance engineering thermoplastic that is either amber or transparent in colour. You may be more familiar with the term ULTEM, as this is the trade name for the only brand of PEI filaments currently available on the market. ULTEM comes in two main grades — ULTEM 9085 and ULTEM 1010 — although Sabic, the material developer behind ULTEM, has also recently introduced two new high-performance PEI materials based on ULTEM 1010. Let’s take a look at the benefits of ULTEM 9085 and ULTEM 1010. Inherently flame retardant: The material is FST-compliant and certified for aircraft components. High strength-to-weight ratio: Parts 3D printed with ULTEM 9085 can be much lighter than some metal parts (e.g. aluminium) whilst offering comparable impact strength. This is particularly beneficial for industries like aerospace where the weight of an aircraft directly correlates to the amount of fuel consumed. High thermal resistance: ULTEM 9085 has a heat deflection temperature of 167°C. Chemical resistance: ULTEM 9085 is resistant to a wide range of chemicals, such as automotive fluids, aqueous solutions and alcohols. The properties of ULTEM 9085 make it an ideal for aerospace and automotive applications, providing high-performance parts and a lightweight alternative to metal. 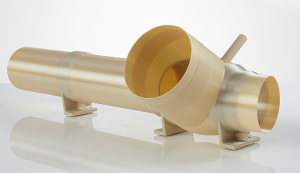 ULTEM 9085 can be used to 3D print interior components, ductwork or electrical enclosures for aircraft and ground vehicles, for example. French aircraft design and manufacturing group, Latécoère, uses ULTEM 9085 to produce functional prototypes, customised tools and air duct housing components additively. Using ULTEM 9085, the company is able to produce customised tools that are 50% lighter. High tensile strength: ULTEM 1010 has the highest tensile strength among of all FDM filaments, resulting in strong and durable parts. High thermal stability: The material has excellent thermal stability and heat resistance, and can also withstand steam sterilisation (autoclaving). Biocompatible (ISO 10993/USP Class VI certifications). Other: The only FDM material with an NSF 51 food-contact certification. Thanks to its high strength and thermal stability, ULTEM 1010 can be used in out-of-cabin aerospace applications (for example, ducts, clips and semi-structural components) as well as automotive applications. Its food-contact and bio-compatibility certifications mean that ULTEM 1010 is a great option for applications such as food production tools and custom medical devices like fixtures, surgical guides, and custom trays. Polyaryletherketone (PAEK) is a family of thermoplastics with high-temperature stability and great mechanical strength. Polyether ether ketone (PEEK) and Polyetherketoneketone (PEKK) are the two thermoplastics which fall within the PAEK family. High thermal resistance: PEEK can withstand extreme temperatures of up to 260°C. Great chemical resistance: PEEK can withstand a range of solvents, acids, and bases. Other: Can be exposed to sterilisation procedures such as autoclaving. applicable in a variety of industries. In certain applications, it can even replace some metals, making a component lighter whilst exhibiting comparable properties. Back in 2015, Airbus Helicopters has replaced the aluminium in the door fitting of its A350 XWB’s aircraft with PEEK, resulting in a 40% weight reduction and improved functionality. 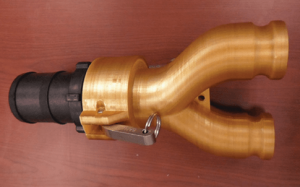 In addition to lightweight aircraft components, PEEK is also well-suited for 3D printing automotive parts such as bearings and piston parts, and custom prosthetics. PEKK is particularly suitable for aircraft components that are exposed to jet fuel, oil and hydraulic fluids, thanks to its high chemical resistance. Another application is using PEKK to produce spacecraft parts that require low outgassing and chemical-resistant industrial parts. A real-life example is Boeing’s Starliner passenger capsules, designed to transport NASA astronauts to and from the space station. The capsules incorporate more than 500 PEKK parts 3D printed by Oxford Performance Materials. The 3D printed PEKK components are said to be almost 60% more cost-effective than traditionally manufactured counterparts. Polyphenylsulfone (PPSU) is one of the strongest 3D printing thermoplastics for engineering applications. Other: PPSU has a high resistance to gamma radiation and is sterilisation capable (including EtO gas, steam autoclaving, plasma, dry heat, and cold sterilisation). PPSU is a versatile material, with applications ranging from automotive to medical. Its resistance to steam sterilisation makes it a good option for 3D printing medical tools, for example. Another use case is low-volume injection moulds, due to PPSU’s resistance to high temperatures. Other applications for PPSU include under-hood automotive components and electronic enclosures. The two main limitations of the high-performance materials covered in this article are 1) high costs and 2) the high level of expertise required to achieve successful printing results. Additionally, there are a limited number of FDM 3D printers on the market capable of handling these high-temperature materials. It also should be noted that many high-performance thermoplastics (PEKK and PEEK) will require some form of post-processing, such as annealing, to ensure they are properly crystalised. Overall, high-performance thermoplastics are a rapidly growing area of materials research. Each of the thermoplastics we’ve touched on in this article have unique properties, making them, in many instances, a cost-effective alternative to metal alloys. Ultimately, this can make them an even better alternative to some metals, opening opportunities for cost-effective lightweight solutions. As more materials manufacturers enter the market, we’ll also see the price of these thermoplastics fall, allowing them to be used in an even wider range of applications. The future of 3D printing with high-performance thermoplastics, then, certainly looks bright. Is the Oil & Gas Industry Ready for 3D Printing?